AIN’T NO AMERICAN PHAROAH, BIIIIIHHHHHH!!! If you logged on the internet yesterday you probably saw that Sports Illustrated (SI) named Serena Williams the SportsPERSON of the Year for 2015. I’ll get to why I had to put PERSON in caps in a moment. First, I have to give many, many kudos to Serena and make sure you know exactly why she is completely deserving of the honor. This year, her record was 53 and 3, she won 3 out of 4 of the major titles and amassed over $10 million in prize money. Her record is the equivalent of your favorite NFL team playing 3.5 seasons in one year and only losing 3 times. Despite injuries and illnesses that could’ve been legitimate reasons to sit some tournaments out, she remained number one in the world (a feat that she’s managed for 3 straight years) and at one point had twice the number points as the number two ranked player. In short, at the age of 34, a full twenty years after playing her first professional match, Serena rules tennis. But the Serena train didn’t stop on the tennis court. Outside of tennis, she’s had one hell of a year too. She displayed her superhero abilities at lunch one day, she slayed the covers of Vogue and New York magazines, and showed up on a couple of movie screens. Serena conquered the world in 2015 and we loved watching her do it. Well most of us, did. Unfortunately, the geniuses who troll the internet and those who show their faces on ESPN from time to time, found issue with SI’s selection. Instead of Serena being crowded SportsPERSON of the Year, these great minds wanted American Pharoah, the American Triple Crown and Breeder’s Cup Classic winning HORSE to take the title. I’ll let you get your slow blinks and “what the ****s” out of the way. Let me go ahead state the obvious issue with their rational; American Pharoah, is a horse. The award is for a person, a human being. American Pharoah is disqualified from consideration because God saw fit to make him a horse, not a man. While what American Pharoah accomplished is worthy of celebration, I think they just have the wrong award in mind. In fact, ESPN (via the ESPYs) has a slew of awards that would’ve been fitting for American Pharoah. For instance, he could have won the ESPY Award for Best Moment, Best Championship Performance, Best Record-Breaking Performance or the Showstopper of the Year. To be clear, American Pharoah won none of these awards, but no one seemed to be to upset about that. 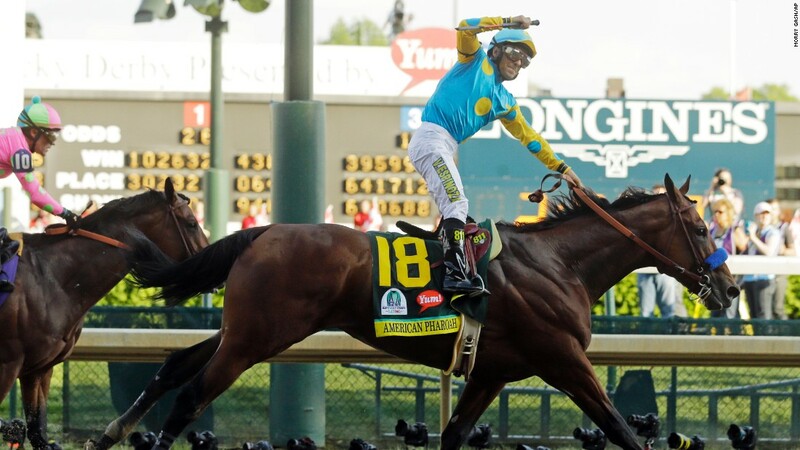 Winning the SportsPERSON of the year award just isn’t an option because, well, it needs to be said again, American Pharoah is NOT a person. The winner, Serena Williams, however, is a person and an awe-inspiring one at that. I’m not certain about the underpinnings that would cause people to get so angry about a phenomenal athlete winning an award for athletes. Maybe it’s the racism that has plagued Serena and her sister Venus since the day they stepped on the court. It’s quite possible that so many people are angry because they’re racist and would rather see a damn horse win an award specifically designed for people than to see a black person who dominates a white sport win it. Maybe it’s sexism that has so many people angry. Like I stated before Serena is just too much woman for some folks. Rather than applaud her success, they want to debase her and her accomplishments by comparing her to a horse. Maybe people are just player haters. Since the dawn of time, no one has been able to please everyone, so perhaps this is all just a case of people not liking Serena because she’s an amazing person who doesn’t let anyone or anything stop her shine; haters hate that sort of thing. And finally, maybe it’s just stupidity and ignorance. Not everyone can read and not everyone has a complete grasp of the English language, so deciphering the meanings of words like person, athlete, horse and human can be pretty difficult for some. I get that. Whatever the cause of the angst, it doesn’t change the fact that Serena Williams is the 2015 Sports Illustrated Person of the Year. Ain’t no American Pharoah, Bih!